FRISCO, Texas - Dallas Stars General Manager Jim Nill announced today that the club has recalled center Justin Dowling from the Texas Stars. It is Dowling's second stint with the Dallas Stars this season. Dowling, 28, has recorded one assist (0-1=1) in six games played for Dallas this season. Over the course of two NHL seasons, all with Dallas, he has registered three career assists (0-3=3) with a 52.6% faceoff percentage in 15 regular-season games played. Serving as Texas' captain this season, he leads the team with 53 points (13-40=53) in 62 regular-season AHL games. His 40 assists are the eighth-most in the AHL this season. In 435 career AHL regular-season contests with Texas and Abbotsford, he has produced 301 points (99-202=301). He has also appeared in 52 Calder Cup Playoff contests, registering 38 points (11-27=38). He helped Texas to two Calder Cup Finals appearances, winning in 2014 and losing in 2018. The 5-foot-10, 180-pound native of Calgary, Alberta was originally signed as an undrafted free agent by Dallas on March 26, 2014. 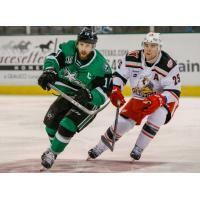 The Texas Stars are the primary development affiliate of the NHL's Dallas Stars, and continue their home stand on Saturday, March 23 at 7:00 p.m. facing the Grand Rapids Griffins. Ticket packages for the 2019-20 campaign are on sale now. For more information or to renew your seats, call (512) GO-STARS (467-8277) or visit TexasStars.com.